I love TextPad. It may not be the best, most awesome text editor out there, but I know how to get it to do what I want to do. Open up MS Excell. Copy your column into Excel. Duplicate that column. Paste back into Textpad. We can do this very quickly with 3 Find/Replaces. Check the ‘Regular Expression’ box. When you drag a folder onto TextPad, it doesn’t know what to do with it. 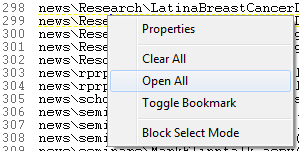 You probably want to search all folders in that folder (ie, recursive search), so check the ‘Search Subfolders’ option. If you want to open all files in all the folders, enter * for What and * for Files. If you want to open all files of a particular type, say TXT or INI files, do * for What and *.TXT, *.INI for Files. 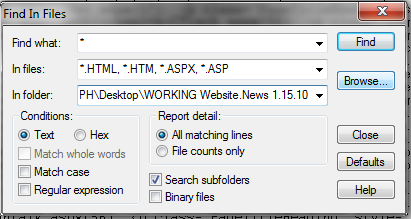 If you want all files with a search term (or regex), enter that for the What. Press Find. You’ll get a GREP looking result. Right click somewhere. Do ‘Open All’.